If you’re like me, then you are completely overwhelmed by the toy mayhem in your home. My little ones have both a playroom and a bedroom they share, but toys seem to constantly end up in our living room. We live in small quarters, so this gets out of control pretty quickly! Living in a small home has taught me that I absolutely need to have systems in place to keep everything organized. With that being said, I’ve found that having some sort of toy organization system in the living room was an absolute must for my family, because toys will always find their way there! 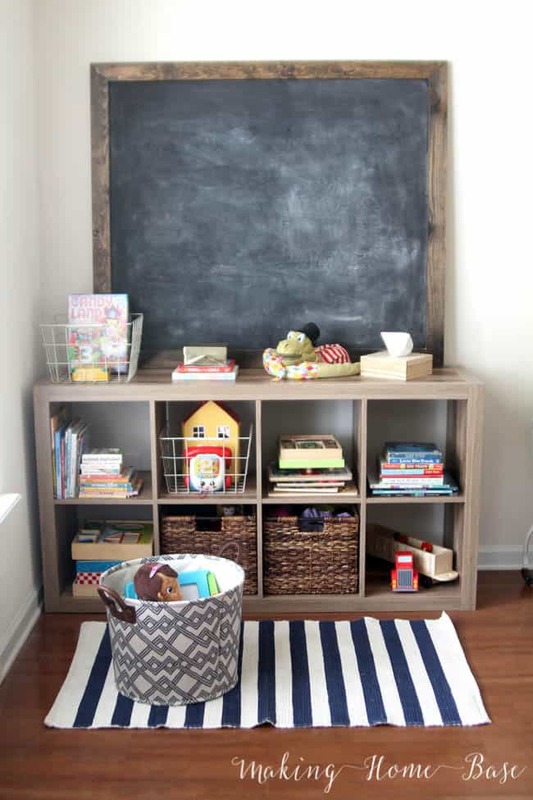 Here are some ideas to keep your living areas clutter free from toys! I’ve found that having a toy rotation system for living room toys is essential to calming the chaos. I allow only a few toys to be in the living room at a time and we continue to rotate toys every so often. This isn’t a perfect system, because my daughter still drags other toys out throughout the week, but following this loosely has certainly helped. I love using these cube shelves to organize everything! I don’t have a local Ikea where everyone tends to buy these, but Walmart carries them in a few colors. Amazon has a cube bookshelf similar to the one shown below as well. You can’t have a list of organizational hacks without talking about multifunctional pieces of furniture! This is the best way to hide organized clutter while utilizing the space you have. 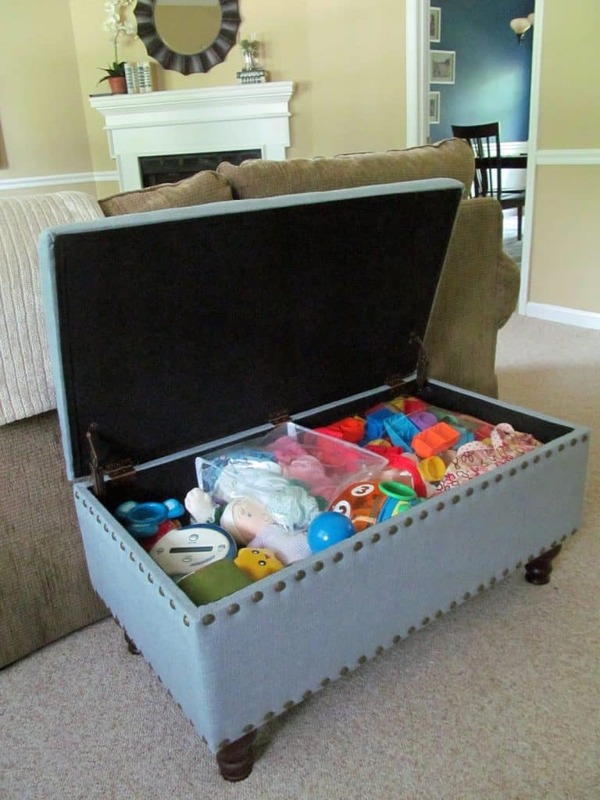 I love the idea of using storage ottomans to store toys in the living room, because the ottomans also double as seating. The ottoman above is a great idea, but what happens when your child is looking for one specific toy? All the toys are thrown out of the toy box and all over the floor. I know how this goes too well, so when I came across this idea I was surprised I hadn’t thought of it before! I organize the playroom and the bedrooms by sorting toy collections, but not in the toy box. This hack has defintely been a game changer! 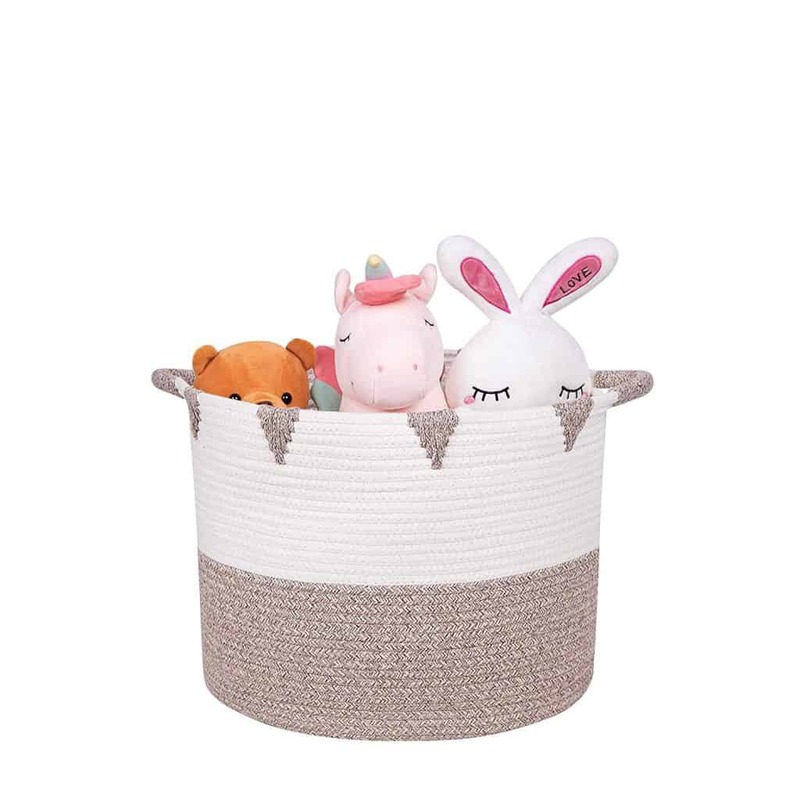 Certain corners in our living spaces tend to be where toys stick around, so I’ve found that keeping decorative baskets in these areas where I can just throw the toys in during a quick sweep really helps. In a perfect world, we would have clean ups where every single item goes back to where it belongs – but just isn’t a reality in my home. We do clean out the baskets and put the toys back where they belong a couple times a week. You can find the basket shown below here. 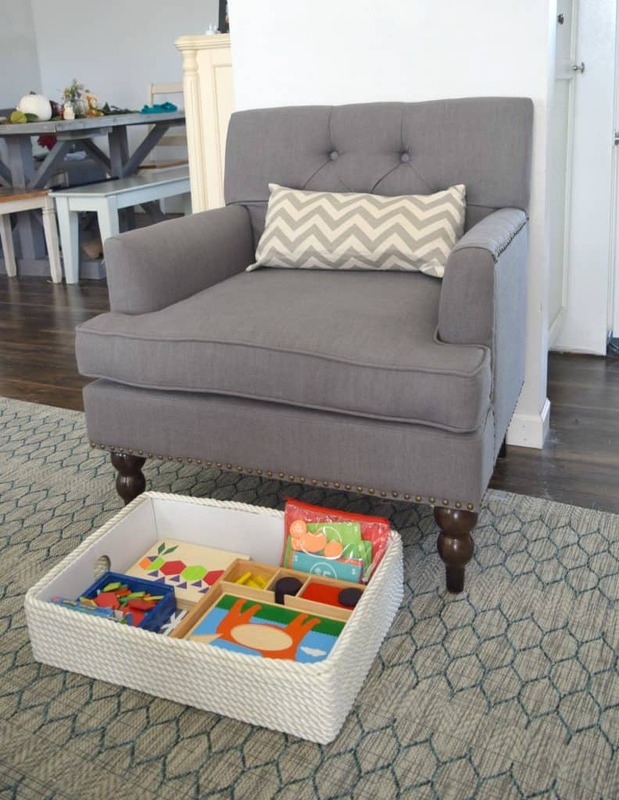 We use this storage hack under beds and cribs, but if your living room furniture allows, try using shallow baskets to store toys! This is a great example by Our House Now a Home! If you’re short on room, a great hack is to utilize vertical space. Tall bookcases and armoires are great pieces to invest in for extra storage. 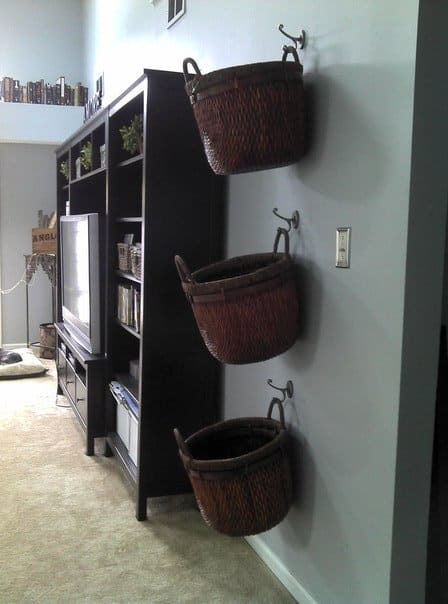 You can also hang baskets on decorative hooks to store toys like the blogger from This Lil House did! 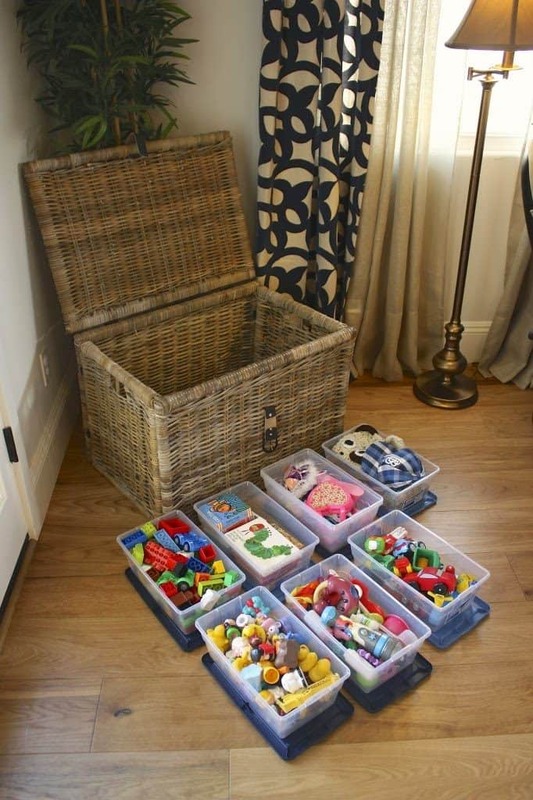 How do you keep toys in the living room organized? Have you implemented any of these hacks in your own home?